Glisten-on with a citrusy splash of jojoba & sunflower seed oils. A glisteningly-sweet dreamsickle of ripe clementine oranges will lift your spirits! 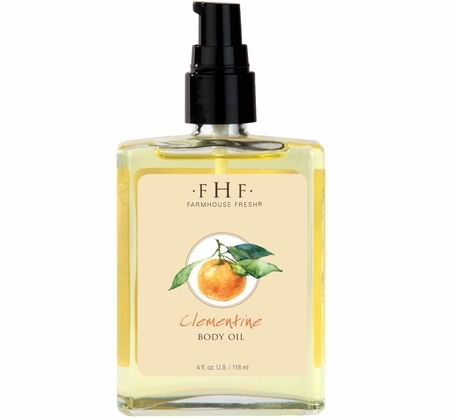 This beautiful vitamin-rich body oil brings an instantly silky, soothing feel to skin. Antioxidant rich Olive Fruit and Grapeseed oils combine with Orange Peel, Jojoba, Sunflower Seed and Apricot Kernel oils to nourish and calm the most sensitive of skin types. Use in your bath water or apply directly to skin as a light but deeply hydrating body oil. Clementine imparts wonderful benefits to skin as Grapeseed and Olive Fruit oils have powerful antioxidants which diminish the look of the damaging effects of sun and improve skin's texture. Grape Seed, Olive Fruit, Orange Peel, Apricot Kernel, Sunflower & Jojoba Seed Oils, Soybean Oil, Shea Butter, Cocoa Seed Butter, Vitamin E.
Glycine Soja (Soybean) Oil, Parfum*, Sorbeth-30 Tetraoleate, Vitis Vivifera (Grape) Seed Oil, Olea Europaea (Olive) Fruit Oil, Butyrospermum Parkii (Shea Butter), Theobroma Cacao (Cocoa) Seed Butter, Simmondsia Chinensis (Jojoba) Seed Oil, Helianthus Annuus (Sunflower) Seed Oil, Prunus Armeniaca (Apricot) Kernel Oil, Citrus Aurantium Dulcis (Orange) Peel Oil, Tocopherol, Centella Asiatica Extract. *All FarmHouse Fresh fragrances are phthalate-free. Doesn't feel oily.....feels dry. Very light scent. They best oil I have ever used! I would buy this oil in every scent. After I shower I put it on, then follow up with the milk lotion. Not greasy at all. I have seen my knee surgery scar lighten up as well. Love the smell of this oil. A light orange smell makes it refreshing on the skin. This is a terrific body oil. The scent is so uplifting! A nice summery scent. Very light oil, glides on and absorbs so nicely. Really great moisturizer!! I love the fresh scent. It's a wonderful moisturizing oil! Love all their body oils! They smell great! They absorb well! Have been using their body products for years and will continue. Also love the work that they do with recusing animals! 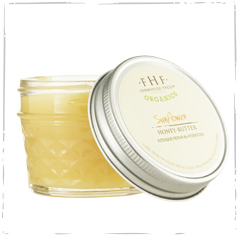 I use this on my arms for a touch of fragrance and my knees and elbows to keep the dry, ash away all day!